How do you read an everyday text? This course will be fully online, and all of our work will be done in DePaul’s online course-management system, D2L. Online courses require good time management, pro-active problem solving, and resourcefulness — all good qualities to have anyway, both in college and in life — so we will be practicing those qualities as part of the course. What are “everyday texts” and why would we want to study them? In college, we traffic in what seem like “elevated” texts and genres: essays, art, case studies, media, scholarship, and books of all kinds. In our class, however, we are going to explore and analyze a concept known as everyday texts, those mundane and easily overlooked documents and texts that we might otherwise overlook or walk right by every day, all day. In part, this course is about looking–about slowing down and looking more closely. Often we find that these everyday texts can be quite extraordinary. Our work will address print, digital, and hybrid platforms for both readers and writers, and no prior experience with production technologies is necessary. 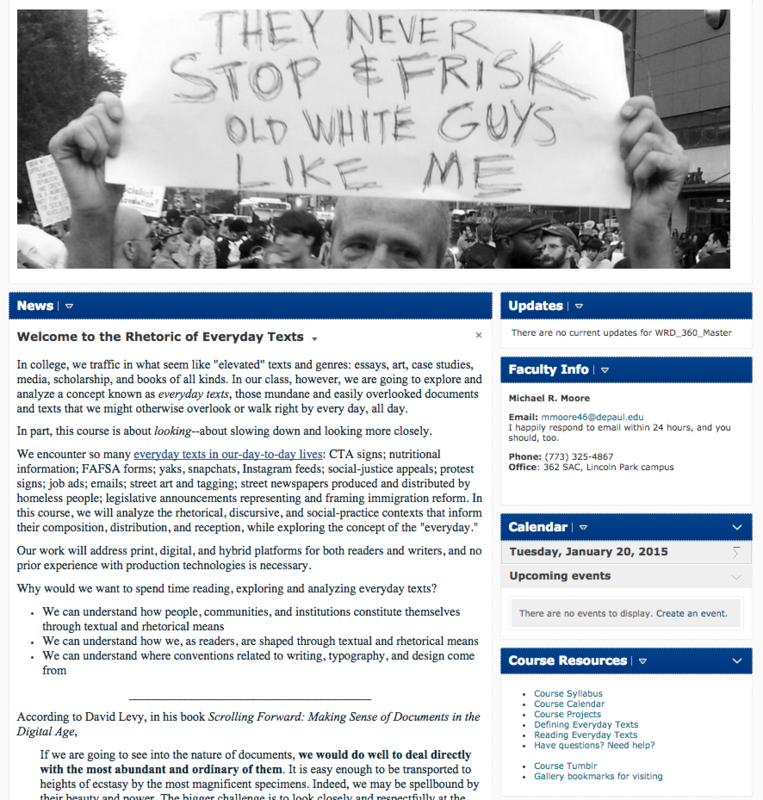 For context, here is the site for the face-to-face version of this course. Writing is a central part of this course. Because writers improve by sharing their work with others and individual pieces of writing improve through a process of drafting and revision, each of you in our class this quarter will work with a Writing Fellow on two drafts. Your Writing Fellow will spend two hours providing you with thoughtful and extensive revision oriented comments upon your drafts. Your Writing Fellow will spend two hours meeting with you—either face-to-face or online in real time—to work on making real and substantive revisions to your drafts. You and your Fellow will spend time, for example, focusing your topic, strengthening a thesis statement, learning relevant grammatical principles, or providing more or more effective evidence for your claims. The goal of this whole process is to help you make smart, significant revisions to your papers before the papers are turned in for a grade. Overall, your Writing Fellow will help you to learn more about the standards for written products in this course, and about the process of writing and revision. If you are thinking about enrolling in this online course and have any questions or concerns, feel free to email me — mmoore46@depaul.edu — or stop by to say hello (362 SAC).